The National Young Farmers Coalition (NYFC) is a leader in efforts to persuade Congress to pass a bill (HR 2590, or the Young Farmers Success Act) that would bring farming under the definition of a public service and makes farmers eligible for student loan forgiveness. The Coalition is staging an advocacy campaign in Washington, D.C. Tuesday and Wednesday (Oct. 6-7), bringing farmers in from around the nation to make their case for this legislation. We are re-publishing, with permission, a blog post NYFC published on its website about its report detailing why the loan forgiveness program is needed to get more young farmers on the land, in an era when the average age of farmers in America has risen to nearly 60. A report by the National Young Farmers Coalition, titled Farming Is Public Service: A Case for Adding Farmers to the Public Service Loan Forgiveness Program, shows that student loan debt is one of the key barriers preventing more would-be farmers and ranchers from entering agriculture. The National Young Farmers Coalition issued a report, titled Farming is Public Service, in support of its campaign to get Congress to pass legislation providing young farmers with student loan forgiveness. • Only 6 percent of all U.S. farmers are under the age of 35. Between 2007 and 2012, America gained only 1,220 principal farm operators under 35. During the same period, the total number of principal farm operators dropped by more than 95,000. • Survey respondents carried an average of $35,000 in student loans. • 30 percent of survey respondents said their student loans are delaying or preventing them from farming. • 28 percent of survey respondents say student loan pressure has prevented them from growing their business, and 20 percent of respondents report being unable to obtain credit because of their student loans. With thousands of American farmers nearing retirement (the average age of farmers is now 58), the U.S. needs at least 100,000 new farmers over the next two decades. 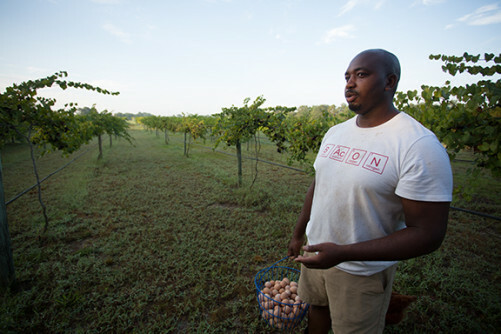 This issue reaches beyond the farm and impacts rural economies, because farmers are often the primary revenue generators and employers in rural areas. Davon Goodwin is a young farmer and veteran from North Carolina. Photo by L.L. Gingerich, provided by National Young Farmers Coalition. 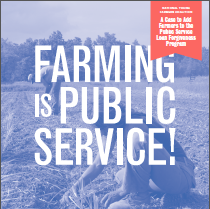 On June 1, legislation was introduced in Congress that would add farmers to the Public Service Loan Forgiveness Program (PSLF), placing the profession of farming alongside careers such as nursing, teaching and law enforcement that already qualify for the program. Through PSLF, professionals who make 10 years of income-driven student loan payments while serving in a qualifying public service career have the balance of their loans forgiven. This bipartisan Young Farmer Success Act (H.R. 2590) was introduced by Rep. Chris Gibson (R-New York) and Rep. Joe Courtney (D-Connecticut). Co-sponsors include Rep. Chellie Pingree (D-Maine), Rep. Tom Emmer (R-Minnesota) and Rep. Zoe Lofgren (D-California). The legislation has broad support from nearly 100 farming organizations, including National Farmers Union, Future Farmers of America, and Farm Aid. If you are interested in supporting the Young Farmer Success Act, please visit our Farming Is Public Service page to learn more and take action. This entry was posted in Family Farms, Farm businesses, Food policy, Good Food Policymaking, Small Farmers, Young farmers and tagged Average age of U.S. farmers, FamilyFarmed, Farmer student loan forgiveness, Farming as a public service, National Young Farmers Coalition, Young Farmer Success Act. Bookmark the permalink.